In Bengal Tiger, a finalist for this year’s Pulitzer Prize, the Ohio-born-and-bred Joseph draws an otherworldly Baghdad, in which the ghosts of the dead wander the streets and the only motivations seem to be guns and fear and a gold toilet seat. Robin Williams as the Tiger, Brad Fleischer as Kev and Glenn Davis as Tommy. Photo by Carol Rosegg. The toilet seat belonged to Uday, Saddam Hussein’s lunatic son. But it is Uday’s gold handgun that dispatches the lordly, starving tiger, which has torn off the hand of one of the American soldiers. And it is that tiger – played by Williams with regal and sardonic ferocity – that begins to ask the questions that demand to be asked: Why am I here? What is God? And if there is a God, why is there war? Killing breeds killing in this Baghdad, where the two soldiers, Kev and Tommy, are only pawns in a war they don’t begin to understand. Tommy (Glenn Davis) is just a little bit more capable; Kev (the excellent Brad Fleischer) is full of bravado but scared to death. “Everything I see every day is just whack, you know,” he whimpers. 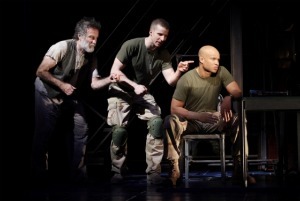 As directed by Moisés Kaufman (The Laramie Project, I Am My Own Wife), Bengal Tiger is filled with menace and casual cruelty: The soldiers point their guns directly at the audience, at close range, and Uday (well, the ghost of Uday) talks to the bloody head of his brother Qusay, which he carries around in a plastic bag. Brad Fleischer as Kev and Arian Moayed as Musa. Photo by Carol Rosegg. The humor, from Williams and the others, is of the blackest sort. And in an environment like this one, any sense of conscience comes from the ghosts – who become considerably more insightful once they’re dead – and from Musa (the immensely moving Arian Moayed), an Iraqi gardener who struggles, with the tiger, to make sense of all he has seen. 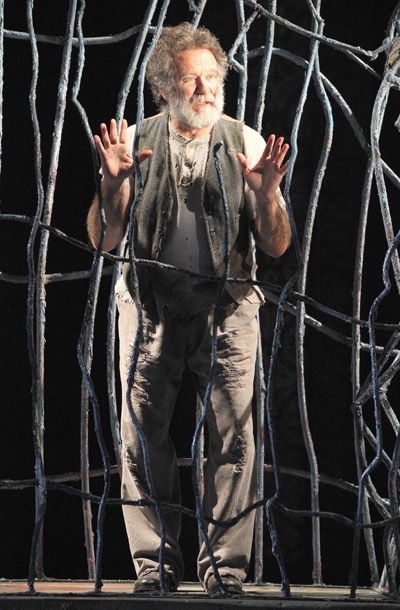 There is no making sense of war, of course, and Joseph’s play will leave you profoundly shaken. But in this uneasy ruin of a city, just who the survivors are, and who they will be, is far from sure. Where: Richard Rodgers Theater, 226 W. 46th St., New York City. When: 7 p.m. Tuesdays, 8 p.m. Wednesdays-Saturdays, 2 p.m. Wednesdays and Saturdays, 3 p.m. Sundays, through July 3. 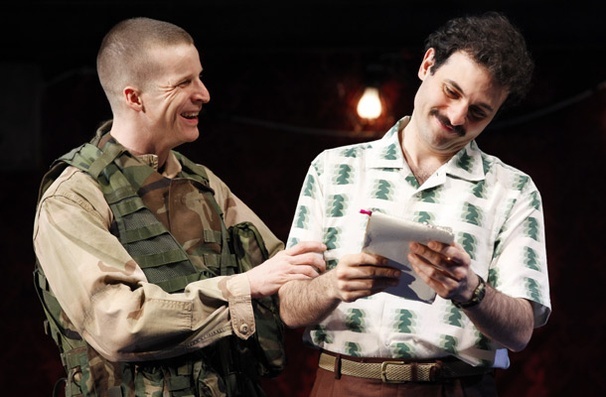 This entry was posted in Broadway, New York theater, Reviews, Uncategorized and tagged Baghdad, Bengal Tiger, Bengal Tiger at the Baghdad Zoo, Moisés Kaufman, Rajiv Joseph, Robin Williams, Saddam Hussein, Uday Hussein. Bookmark the permalink.